There are so many things you can do with postcards. They're cheaper to mail than letters, making them a preferable promotional tool for snail mail campaigns. They also have more space than business cards, which means you can put more information on them. This is the ideal solution for those of us who might have trouble filling all 6 panels of a brochure. Plus, most websites offering online postcard printing have handy design tools, so you can easily get what you need with minimal effort. Thanks to online printing company PrintRunner offering to sponsor a giveaway, now you have the chance to win a set of 100 postcards. Also, the fine print: Giveaway is open to US Residents only, ages 18 years old and above. And my disclosure: In exchange for hosting this giveaway, I will receive a set of postcards. For a better look at the postcards, check out PrintRunner.com. Entering is easy because Rafflecopter is such a wonderful thing. Just use the handy widget below, and good luck! Entries close at 12:01 EST on April 12, 2012. A huge thank you to PrintRunner for sponsoring this giveaway! 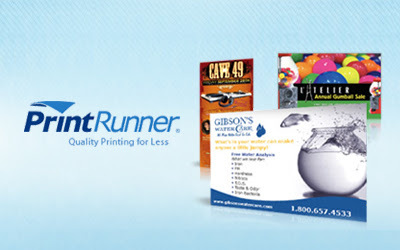 They have been in business for 10 years as a full service, high quality printing company located in Chatsworth, CA. What a great give away! Thanks for a chance to win. I would love to send out postcards that say to "Pray for Me in Nicaragua this June"!! I own a business and it would be great to have some thank you postcards to mail out to clients.